GDPR is short for “General Data Protection Regulation” and it is Europe’s new regulation over for data protection laws. It replaces previous regulation which dates back to 1995 – almost pre internet. It outlines new rules for organisations about the lawful basis for collecting personal data as well as new rights for people in terms of being able to request what data and organisation holds on them and their right to be forgotten – to ask an organisation to remove data they hold. We carried out a lot of research when implementing the new GDPR regulations and we found lots of useful information from the UK regulators website – the Information Commissioner’s Office. Well worth a read if you want to find out more about the regulations in detail. What did this mean for Highrise Digital? Like most organisations, we collect personal data from our customers and others, and it meant that we have to be more transparent about what we collect, who we share it with and how we store this data. It has turned out to be a good thing, although it has taken a while to implement! Analytics software we use on our websites in order to try and get a better understanding of how our websites are being used, so that we can improve them in the future. To get ourselves ready for GDPR meant that we had to carry out a few tasks and then come up with a plan to put in place to meet the needs of the GDPR. In this post, we are going to focus on a just a few areas of what we have done in terms of getting ready for the GDPR. A big part of collecting personal data for us, was the information that we collect online through various forms on our website. What forms do we use? Newsletter signup form – we run a quarterly newsletter about WordPress website management which people can sign up to, collecting first and last name as well as the email address. Project start form – this form collects all of the information about a client when we start a project. This includes name, company name and email and address and invoicing details etc. WP Mentorship form – we run a mentorship group, helping other WordPress developers and people signup through our website providing their name, email and why they want to be part of the group. One of the elements of the GDPR is being able to have evidence of what data you collected and when and what consent (or other lawful basis) you are using in order to process the data. Therefore to try and meet these needs we did a few things. Used a popular form plugin called Gravity Forms. When a user completes a form, this creates an entry in our database with lots of useful information for this audit trail. This includes the date and time of the entry and also all of the options they selected when filling in the form. Privacy FAQs – underneath our online forms we provided some simply FAQs in an accordion style display to answer some common questions about what data the form collects and what we do with the data. The aim here was to be completely transparent with customers. I won't lie, getting ready for the GDPR has been difficult and time consuming, however the new regulations are good for people in general and it has been a good opportunity for our business to be more transparent about what we do with data. I hope what we have implemented makes it easier for users to understand what data we collect, how we use and share this data and what their rights are. 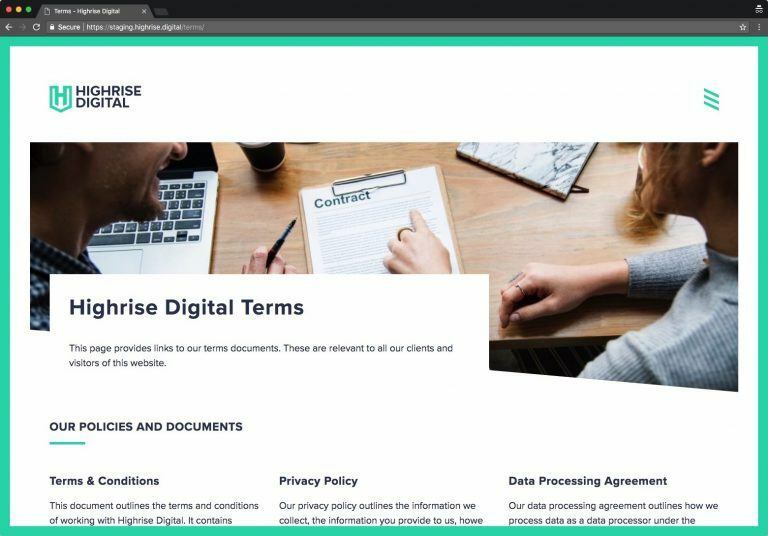 Based on the new requirements we created four main documents, to help be more transparent with customers and users and outline the main points regarding data and data protection. You can view all our terms documents on our terms page here. what our security procedures and policies are. This document is our general terms and conditions document that applies to pretty much all our customers and people we work with. Although it covers data protection it also looks at a number of others areas in the way we operate and do business that we think it is important for clients to know about. In this document, we are trying to outline how we process the data in accordance with the new regulations. Leading on from earlier in this article, an important part of the audit here is to understand exactly what user and customers have agreed to. As our policy documents are always going to change with time, we needed a way of knowing what a particular document looked like when a user agreed to it. 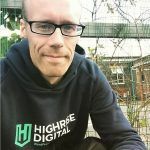 To solve this problem we turned to a solution that here at Highrise Digital we use everyday when developing WordPress websites. 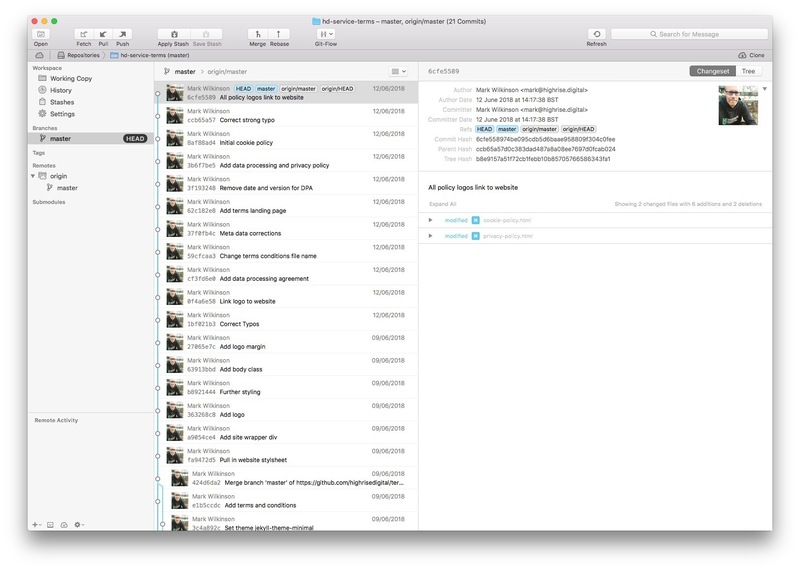 This is called version control and is software that tracks every change to a file. Version control provides a history of all the changes to a file or document. This was perfect and we have put all our policy documents under version control. They all live on Github and are served to our website visitors using Github pages. This means any changes to the documents will be live instantly and those changes will be tracked. As each entry to our online forms is time and date stamped, the version control software allows us to see exactly what that document looked like at that point in time.